Microsoft has been trying to beef up its store for Windows 10, and especially trying to integrate its new operating system across multiple devices from computers to phones to its gaming console. Now the company is trying to enhance that even more with a new update to its Xbox beta app for Windows 10. This is intended to add features that users were looking for and it is asking for feedback on what the customers think and what they still would like to see added. New additions include an Avatar store, which was already built into the Xbox but can now be accessed from PCs and phones. 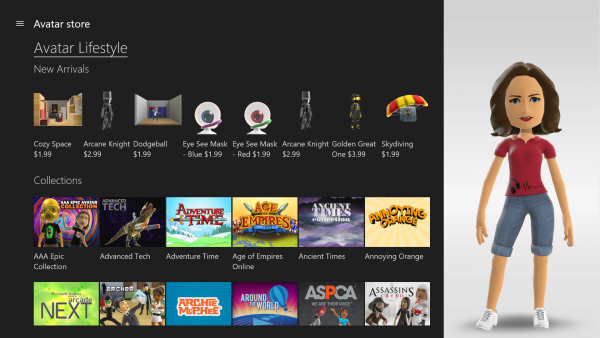 You can beef up your avatar with all sorts of items which Microsoft claims consists of the "entire catalog of new and oldie-but-goodie items, including free items". There's also news items being added, including game releases and updates. There's an update to trending apps, giving more access points. There's improvements to suggested friends which Microsoft says "if you click 'see all' or double tap on the shortlist of friend suggestions in any scenario, you will be pointed to a full-screen view of all suggested friends". There's also an improved activity feed and a compact mode has been added as well. All of this is rolling out now, but it's one of those things where users will receive it on a gradual basis, so you'll have to keep an eye out.